IGERT Fellow Destenie Nock mentored two students who participated in an interdisciplinary program on Electricity, Flexibility, and Sustainability. The program was led by Eve Vogel, faculty in Geosciences, and focused on the role of hydroelectricity in New England. 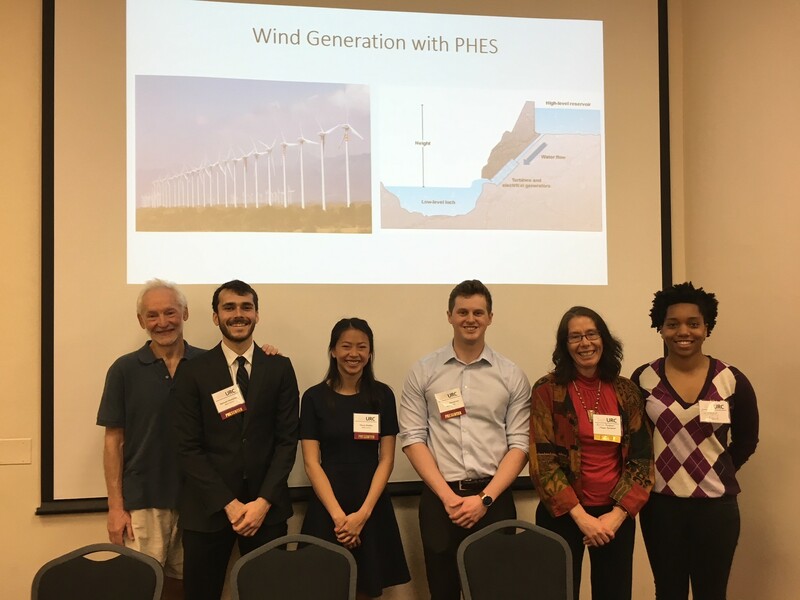 Tristan Koopman, senior electrical engineer, and Olivia Pfeiffer, junior mechanical engineer, presented their research on the interactions between wind energy and hydroelectric power generation at the Undergraduate Research Conference on April 27, 2018. Photo caption: From left, Professor Bernie Morzuch; Undergraduates Sam Hostetter, Olivia Pfeiffer, and Tristan Koopman; Professor Erin Baker; Graduate student Destenie Nock.